Windows 10 is coming with a ton of new features, and one is Cortana, the digital assistant on Windows Phone. Here’s a video demonstrating what to expect. 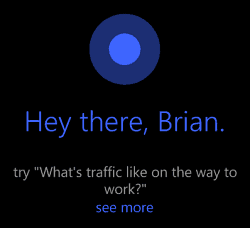 Windows Phone users already know of Microsoft’s digital assistant, Cortana, and it’s one of the new features coming to Windows 10, which is scheduled to be released later next year. And now we have an idea of how Cortana will work on the desktop. The tech site WinBeta got access to a pre-release version of Cortana running on Windows 10 and put up a video showing it in action. Remember this is a very early pre-release version and not a representation of the final product. But it is an interesting watch. While Cortana isn’t available on the current build of Windows 10 Technical Preview, if you become a Windows insider, you can test out the new operating system yourself – and it’s free. One would assume that there will be a few versions of Cortana in different builds that come down the pike during this testing phase. What do you think of Windows 10 so far, and are you looking forward to using Cortana on the desktop? Head over to our Windows 10 Forum and join the discussions. I already subscribe to your news letters. Nevertheless, every time I read groovypost.com I get a pop-up window which tells me to subscribe (again?). Please fix this. I only need to subscribe once.